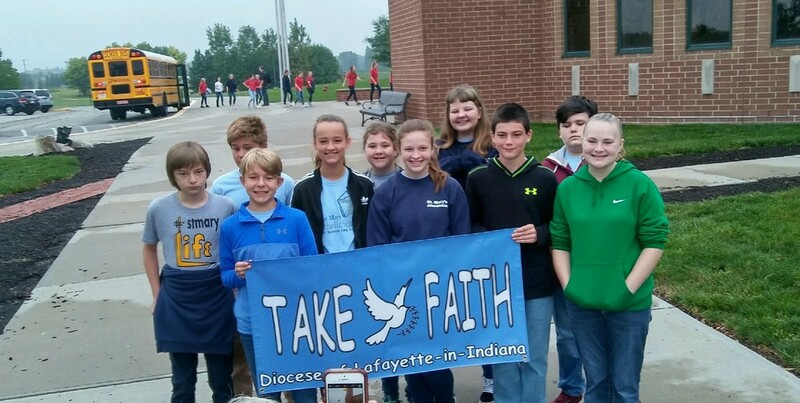 What does #TakeFaith mean in the Diocese of Lafayette-in-Indiana? It&apos;s more than just a project or a challenge for Catholic Schools Week. Faith is infused in all that we do in our Catholic Schools and everywhere we go. We must take our faith with us and proclaim our faith to others. Beginning Catholic Schools Week 2018, our schools will #TakeFaith everywhere they go and in all that they do. They will share their faith with the school community, the parish and all across our diocese. Follow our schools and see where faith leads them over the next year. You can follow this journey of faith right here on the #TakeFaith page and on our social media accounts using the hashtag #TakeFaith. WATCH THE VIDEO ABOVE TO HEAR FROM STUDENTS ACROSS THE DIOCESE ABOUT FAITH. How do our Catholic Schools #TakeFaith ?